As reported in several publications, including this article from MSNBC, Timothy Adams, a member of a homeowners association in Omaha, Nebraska, has taken some unusual steps to engender support for his fight against his homeowners association as he battles to keep solar panels installed on his home. 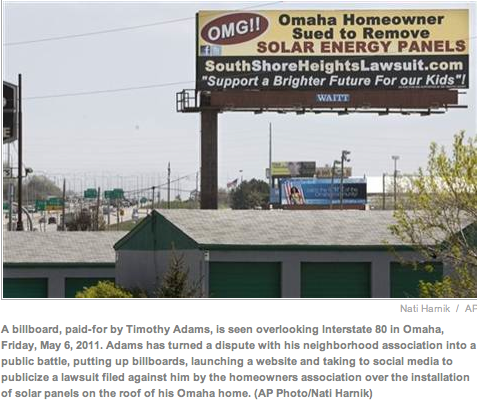 According to the MSNBC article, homeowner Adams is being sued by South Shore Heights Homeowners Association after he refused to take down the solar panels he had installed on his roof. While we have seen owners publicize their positions in letters in an effort to garner fellow owner support for their positions, Adams is spending a lot of money (and vows to spend even more) trying to generate support for his cause by putting up billboards, launching a webpage, sending letters to neighbors and utilizing social media. This dispute started in the fall of 2010, when Adams installed the solar panels without first seeking his community association’s prior approval. While he stated that the was ignorant of the rules requiring architectural approval (not a good excuse), Adams says there is nothing in his HOA’s CC&Rs restricting or prohibiting the installation of solar energy devices. His association’s president was quoted as saying that the governing documents require (as is fairly typical, even in California that requires that community associations allow solar panels) that all owners must seek prior approval from the board before making any exterior additions or improvements to their home. The association’s president also says the board provides copies of the association’s rules to all owners annually to keep them advised of these sort of regulations. Once it was discovered that Adams was in violation of his association’s restrictive covenants, the association sought to resolve the situation by sending him letters that asked him to remove the panels before the association filed its lawsuit against him in March. Adams takes the position that the environmental benefits of solar panels should outweigh his association rules, but that is not the law in Nebraska. While about half the states across the U.S. (including California) agree and have laws that protect homeowners’ rights to install solar energy devices/panels, as Nebraska is not among those states, it is likely that he will be required to remove his solar energy panels from his home. Although California law prevents associations from outright prohibiting the installation of solar panels, the Code does allow associations to regulate placement of solar panels. Follow this link for an article we previously posted that dealt with this very issue and a court case where an owner was required to remove solar panels that were found to have been appropriately prohibited by a homeowners association in Valencia, California. While Adams waits for a trial date to be set, he says he’s willing to spend tens of thousands of dollars to educate people about solar energy and enforce changes, and will continue pursuing unique actions to get the word out. If you want more information or advice as to what your California homeowners association can do when faced with a similar issue, contact David Swedelson via dcs@sghoalaw.com or by phone (800) 372-2207.